The other day I was reminded of a phrase I hadn't used in a while - "In my end is my beginning and in my beginning is my end." I happen to love oxymorons and I have just made a mental note to look up the origin of the word (another post) because it does contain the mini-word "moron" and although these seeming contradictions may look a little idiotic at first, they are far from nonsense. So now we have the beginning of a new year, with the end of the old year and I had been thinking about this post and the picture that I would take as part of the 365 photo challenge. Well, I couldn't get the image of another puzzle out of my head - "What came first the chicken or the egg?" The egg has always been the symbol of a beginning. Pagan cultures have used the egg to signify Spring or the beginning of a new cycle in nature. The egg or embryo is the beginning of a new life in the animal kingdom, of which we are apart :) It is also a powerful metaphor of our existence, so fragile and yet so very potent!! Seeds hold so much promise, but they are an enigma - how did the first egg come to be, for surely the seed came first. Are they many sided or just spheres with no sides at all...or one eternal side. They are aesthetically beautiful and they are canvases for beautiful art. 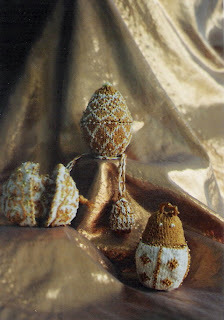 Faberege created the most exquisite egg shaped curios, focussing on the secrets inside the eggs. Jonathan Swift used the oval shape of the egg to satirize war - you were either a "big endian" or a "little endian" depending on how you loaded your egg cup. People took sides, and wars were started!! Can you imagine a world where you were classed by how you ordered your eggs. I can see the troops gathering along route 66, patrolling all those forgotten diners with their "eggs any style" menus. Suddenly you don't know if you should be scrambled, poached, sunny side up or over easy but your life depended on it!! I know that I never order a boiled egg in North America, because they require egg cups and well, that's another story. 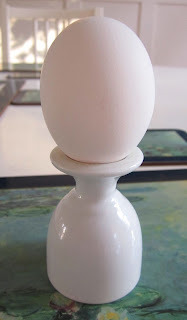 So here is my photo take on the egg. Maybe it is also significant that eggs are a breakfast food to start the new day. There was a very popular British ad on TV that used the slogan "Go to work on an egg." There was always another character in the ad that would say, "duh, I go to work on a bus!" Eggsactly!! What an interesting post...around an egg! It is a fitting symbol for the birth of a new year, isn't it? Sorry I can't help you with the spam. Thank you Norma. Have a very Happy New Year too!! Oh yes, imagine troops on Route 66, patrolling all those forgotten diners with their "eggs any style" menus! Love it, great read,and LOVE the pictures. I look forward to reading more from you during the Ultimate Blog Challenge!